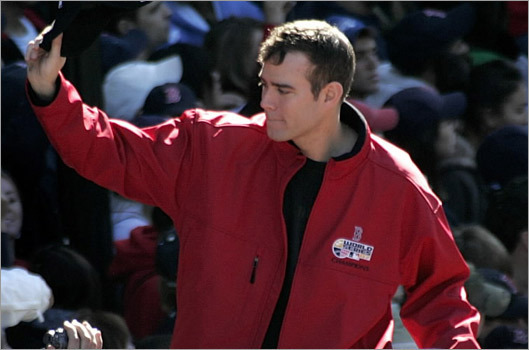 It's better late than never for Red Sox GM Theo Epstein and wife Marie Whitney, who gave birth today to the couple's first child, a healthy baby boy named Jack. Originally due Saturday, the baby, weighing 7 pounds, 14 ounces and measuring 20.5 inches, was delivered at 10:35 a.m. at a Boston hospital. Neither Epstein, who is fiercely private about his personal life, nor the Sox had an immediate comment. Later, team spokesman John Blake called to say "everybody's doing fine...The family would appreciate some privacy." It is the fifth grandchild for Epstein's parents Ilene and Leslie. Theo's sister, writer Anya Epstein, has two daughters, Sylvie and Eve, with her husband, actor Dan Futterman, and Theo's twin brother Paul Epstein has a boy and girl, Ezra and Annika, with his wife Saskia Grinberg. For what it's worth, there haven't been many notable Jacks in Sox history, the greatest being right fielder Jack "Jackie" Jensen, who was the AL MVP in 1958. Less illustrious were slugger Jack Clark, who played for the Sox in the early '90s, and Jack Brohamer, who toiled for the Old Towne Team in '78 and '79.